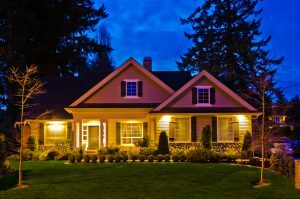 A little lighting goes a long way toward home security. The right household lighting can not only improve your home, it can also make your life easier. After all, what else can create the perfect mood for your dinner party while simultaneously defending your kids from the dreaded monster under the bed? But in the last decade or so, household lights have evolved to become home defense tools, too. The incandescent bulbs most of us grew up with have been replaced by energy-efficient LEDs (light-emitting diodes) and CFLs (compact fluorescent lamps), and smart home technology has made it easier than ever to use indoor and outdoor lighting to safeguard your home and your family. Make sure your bulbs are up to the task. Swap out any incandescent bulbs for LEDs or CFLs, if you haven’t already done so. 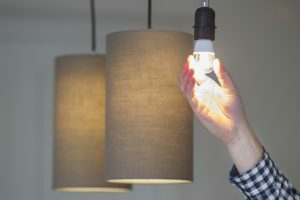 If you’re looking to make your home look lived-in while you’re on, say, a vacation in Maui, these newer bulbs are far more reliable than their old incandescent counterparts. That’s because they have drastically longer lifespans than incandescents, so if you leave your lights on while you’re away, you won’t have to worry that they’ll burn out or get too hot. In fact, LED bulbs last an average of 25,000 hours, compared to just 1,200 hours for incandescent bulbs. That means you may not need to replace them for up to a decade, so they’ll most likely keep your home looking occupied until you get back from vacation. Not only do motion-sensing lights automatically illuminate your path when you come home in the dark, they can also scare off would-be intruders. Install them as close as possible to both your front and back doors, and make sure some light comes into your space when they’re illuminated. This way you’ll be alerted to any motion outside. Sometimes false alarms do happen — for instance, when the friendly neighborhood raccoon visits your trash can at 2 a.m. If you find the light disruptive, you may be able to adjust settings to make it less sensitive to motion. Many lights offer the ability to change the detection distance and reduce how long the lights stay on when triggered. Outfitting your home with smart lighting fixtures may seem like a daunting task, but it’s well worth the cost and effort. Smart home tech empowers you to control your household lights on your smartphone from anywhere in the world with a Wi-Fi connection. There are a lot of Wi-Fi-connected bulbs to choose from, so start by evaluating how many bulbs you may need. If you can outfit most of your fixtures with the same type of bulb, consider buying a multi-pack from the same brand so you won’t need to use multiple smartphone apps to switch them on and off. If, however, you have a more complex lighting system, you may want to consider investing in a smart home hub (a.k.a. virtual assistant or smart speaker). These devices allow you to control all of your Wi-Fi-connected gadgets from one app — and even through voice control. As an added bonus, you’ll be able to control most connected appliances you may buy in the future — like security cameras, locks and thermostats — using the same hub. Technology can help your empty home look lived-in. If you’re not in the market for high-tech smart lighting, a simple outlet timer is an effective backup plan. Mechanical timers allow you to program your lights to turn on and off throughout the day, and you can pick them up for just a few bucks a piece online. But keep in mind that they’re typically only on 24-hour cycles, so they’ll follow the same schedule every day. For a couple more dollars, you can invest in digital timers, which are easier to use and offer more programming options. They allow you to program a full week of activity, which means you can schedule lights to turn on at varying times every day. This can help your home look occupied even if you’re away for a few days. Above all else, remember that your lighting should mimic your normal day-to-day behaviors in order to deter would-be thieves and home invaders. Most people don’t typically turn one light on in the evening and keep it on all night, so schedule your lights to turn on and off in different rooms at different times, as if you were moving through the house. 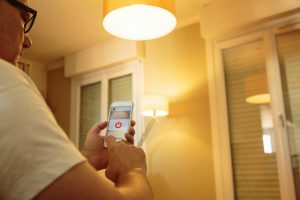 Most intruders only want to enter homes when no one’s inside, so a smart lighting strategy may just help keep your home and belongings safe. Jon Snyder is a Product Manager at Esurance. Jon oversees the countrywide design of property insurance products. He has over 25 years of experience in home and auto insurance, and he writes on a variety of topics, including how smart home products (like smart lights) can improve your home safety. To learn more about Esurance’s home insurance policies and security discounts, visit their website.